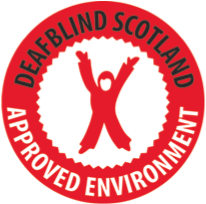 Deafblind Scotland supports companies to become wholly accessible business environments with equal access for all. Your premises will be equipped to deal with the everyday challenges faced by deafblind persons and those with varying levels of visual and hearing impairments. Your workplace and public areas will become more practicable, and all stakeholders reached through more accessible communication practices and assistive technologies. 2-hour workplace assessment, and liaison with relevant personnel on current communication practices. This assessment is based on a best practice approach in meeting your duty of care to adhere to relevant legislation and regulations, including equality legislation, building regulations and health and safety regulations. Written report produced by Deafblind Scotland with recommendations on how your business premises and public areas can be made more accessible for deafblind and/or persons with sight and hearing difficulties. A designated advisor will be appointed to your business and our team will be available for ongoing guidance and support. 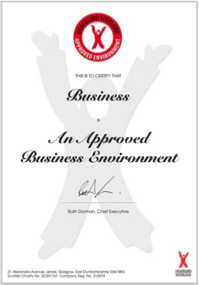 A certificate of endorsement and ‘marking’ recognising your company as an approved business environment will be provided to place on your on and off line resources, to be reviewed annually. Contact John Whitfield on jwparticipation@deafblindscotland.org.uk for further information.